Does this look sad enough for you? I'm sure he could dial it up a notch. 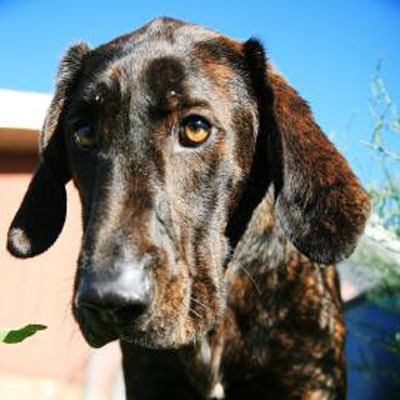 Bogey is a 2-year-old male hound mix who weighs 67 pounds. He was originally brought to Lollypop Farm because his owner was moving. This beautiful boy has a brindle coat and a very melodious voice, which he's not afraid to use when he sees something of interest! Bogey has learned to walk quite well on his leash with an Easy Walker harness. He would do best in a home with children over the age of 16 as he's quite a big guy, and should meet any dogs in your home just to be sure that everyone will get along. Bogey and his new family will be required to attend training classes together so Bogey can learn to be a perfect gentleman. The first session for adopters is offered at a discounted rate. Could you be the person Bogey has been so patiently waiting for? Clymie, the cat from last week, is still waiting to find her new home.